Here at EzyMugs we love promotional glassware – it looks stylish, it can be used across the board and will fit in with almost any promotional campaign. However, we are highly aware that it is also easily broken. Many companies don’t want to spend thousands of dollars on branded glassware that could easily get broken if not handled correctly. That’s why we also love our branded polycarbonate lass range and one of our favourite products in this range is the Sunset Old Fashioned tumbler. 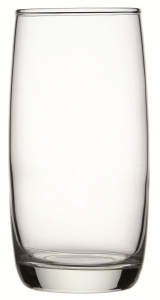 These 275ml tumblers are a great alternative for gifting to customers or to those who use your glassware in their restaurants and cafes. They hold a really great coloured logo print, and, due to being made with a polycarbonate material, are long lasting and hard wearing. The Sunset Old Fashioned Tumbler is a popular choice as it can be used for all drinks. The style is similar to a spirit glass, but it can also be used for juices and soft drinks which extend the promotional reach of your brand. The large 275ml size makes is a great option for restaurants and cafes, as well as function and events centres; it is also a good choice for presenting as a gift to your clients and customers in gift baskets and boxes, as giveaways or simply used as promotional merchandise. It’s always hard to find good looking promotional glassware that is able to withstand use after use, and round after round through the wash cycle. The Sunset Old Fashioned glass holds a logo print well and you can be sure this will last through many uses. As a multi-purpose promotional glassware item, a branded Sunset Old Fashioned glass is great for any promotional requirement your company has.